To help make the dream a reality, we are offering a winter special on sailing tickets purchased in advance. Purchase your tickets for our 2018 sailing season online at www.maineschooners.com, and receive $5 off the regular ticket price for each member of your group. Use the code 18winter5 during checkout. This special will start immediately and run until the spring equinox on March 20th. Are you thinking of booking a private sailing charter on the Schooner Olad or Cutter Owl for a wedding or other special event? We are offering specials for booking private sails in advance as well. Please call 207-236-2323 or email [email protected] for more details. Celebrate this Holiday Season with the gift of Sailing! It's once again that wonderful time of the year! When looking for the perfect gift for the sailing enthusiast in your life, search no further! We have the perfect gift for them! Give the gift of a two hour sail on one of our beautiful wooden vessels this holiday season. Your loved ones will be so happy you did! We are available for the purchase Of Olad and Owl gift certificates for sailing by calling 207-236-2323, or our online store at www.maineschooners.com. Our gift certificates never expire, and are good for up to 2 hours of sailing throughout our season. We also have a great selection of t-shirts, hats, sail maker bags, and other sailing oriented gift ideas. Orders typically ship next day, so you'll have your items well in hand before Christmas. We hope you enjoy a great holiday season with family and friends! Question of the day: When will your last day of sailing be? We're happy to say that we will be sailing the Schooner Olad until October 22nd! Our last public sail of the season will be at 10am that day. The week ahead is looking like more of the same great weather that we've been blessed with most of October. We will be sailing at 10am, 12:30pm, and 3pm daily until the 22nd, weaqther permitting. We hope you'll be able to join us before we say goodbye to the 2017 sailing season! Our Sailing Season Isn't Over Yet! One more month of sailing in our season remaining, and it's sure to be some of the best! Fall in Maine is beautiful and breezy, lending to some picturesque scenery and great sailing conditions. It may be a little cooler on the water, but bring a hot beverage and your camera to capture the beautiful foliage, and we'll keep you warm and entertained with our woolen blankets and stories of the sea. The Cutter Owl will be sailing through to the end of September for public sails, while the Schooner Olad will end it's season closer to the end of October. The Owl will also be available with advance notice for private charters in October, weather permitting. The crowds are light, the kids are back in school, and the sailing is looking to be fantastic. We hope you'll join us! For reservations, please call 207-236-2323 or visit us on the web at www.maineschooners.com. Are there really only 2 more weeks of August left?!?! Summer has gone sailing by, but there's still time to get in a cruise aboard a beautiful sailing vessel on Penobscot Bay before August comes to a close. We've had some truly exceptional days for sailing this summer, and we're looking forward to many more as we move into our late summer and fall sailing seasons. We've moved our sailing schedule in the evenings to accommodate the earlier sunset. Both the Olad and Owl will be leaving the dock promptly at 6pm for a two hour sunset sail until September when our schedule will switch again. As with any of our cruises, bring along your favorite snacks and beverages to further enhance the experience. We'll take care of the rest! 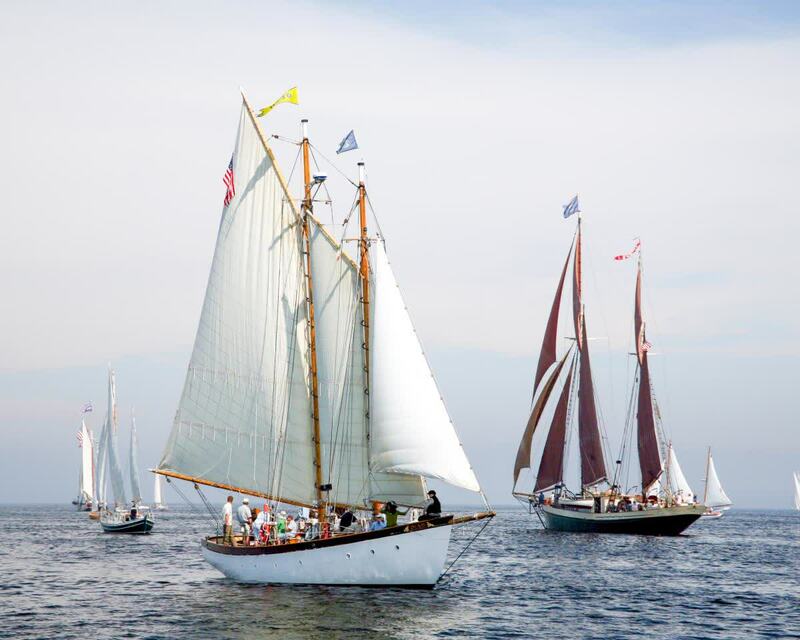 Labor Day is soon upon us, with lot's of fun activities at the Camden Windjammer Festival. We'll be sailing all weekend to get some great views of the beautiful windjammers making their way into Camden for the weekend's festivities. We hope you'll be able to join the fun! Summer days are here, and the sailing is great out on Penobscot Bay. The warmer weather is perfect for evening sunset sails. Bring along a bottle of wine and some snacks, and enjoy the relaxing view as the sun sets behind the Camden Hills. We'll be continuing our sunset sails for only a couple more weeks on the Schooner Olad, so book yourself a romantic evening with us while the long days last. Our next special event will be a morning sail and luncheon lobster bake on August 10th. Spend a great day with us out among the islands of Islesboro, and enjoy a terrific lobster bake prepared for you by our crew. To book, please call 207-236-2323 or visit www.maineschooners.com. We'll be seeing you out on the water! Lobster bake season has arrived! Along with the many private lobster bakes that businesses and families have booked this summer, we're also offering 4 public lobster bakes during the months of July and August. Join us as we sail to Warren Island through the archipelago of Islesboro from Camden Harbor. We'll dock at the state park and while you're exploring the island, we'll prepare a traditional Maine lobster bake for you. On the way back to Camden enjoy the beauty of a relaxing sail back to our home port. We're offering public lobster bakes in July on the 20th and 27th, and in August on the 10th and 17th. To book, visit us online, call 207-236-2323, or stop by our desk on the dock or our shop on Main St in Camden. Celebrate the beginning of summer in style by setting sail with us on the longest day of the year. We'll leave Camden Harbor at 4:15am to make our way into Penobscot Bay to watch the sun rise over the outlying islands. To make the early morning easier to bear, we'll have coffee, tea, pastries, muffins and fresh fruit onboard for everyone to enjoy. To make reservations, please visit our website or give us a call at 207-236-2323. To celebrate this upcoming holiday weekend, we are offering $4 off tickets when purchased online on our website using the code 17Ticket4 at checkout. Buy your tickets for this weekend or for a future sail with us this summer on either the Schooner Olad or the Cutter Owl. This special ends May 31st. The Cutter Owl will start it's sailing season this weekend as well! Experience a sail on the smaller of our two sailing vessels, and you won't be disappointed. Accommodating up to 6 passengers, it's a great boat for small groups who would like a sailing trip all to themselves. We hope you're able to come sailing with us this weekend, but whatever you do enjoy! Let the Sailing Season Begin! We start our sailing season today!!! The Schooner Olad will be running public sails, weather permitting, starting this Thursday the 11th, TODAY! Friday and Saturday look especially good for taking mom out for a Mother's Day sail. Come into Camden to participate in the area's Camden is Blooming event, and enjoy the many sales and specials going on all weekend. Our store will be celebrating it's opening for another season with 10% off store merchandise and $5 off sailing tickets all weekend long. Please stop by and say hi, or give us a call at 207-236-2323 to make reservations. You can also book right on this website!